First Congregational UCC was the first church in Asheville to install solar panels. It was achieved through the hard work and ingenuity of our very own members, with some advice and guidance from AIRE NC and NC Interfaith Power and Light. Below is a picture of Sundance Solar employees installing the panels in spring 2011. We worked with Interfaith Power and Light to get our solar panels, an organization that is working with 14,000 church congregations in response to climate change. 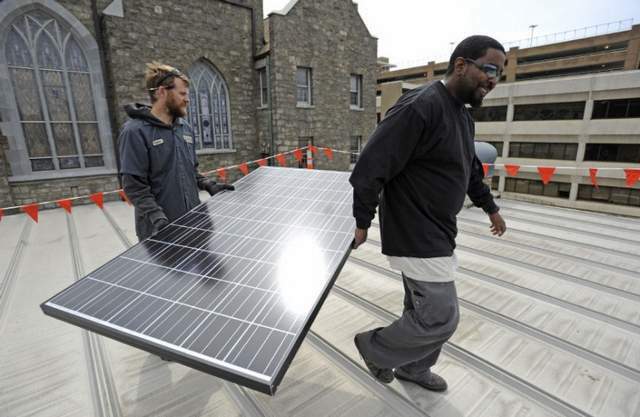 "Asheville’s first community solar project is on the roof of the First Congregational United Church of Christ. The Earth Team at the downtown church initiated it with help from Richard Fireman, the outreach coordinator for North Carolina Interfaith Power & Light (a program of the N.C. Council of Churches). Fireman also works with the Appalachian Institute for Renewable Energy in Western North Carolina. Sundance Power Systems installed the 42-panel, 10-kilowatt system, which was financed for the most part by church members, who formed a limited liability company called First Church Solar. Stan Corwin and Ron Martin-Adkins manage First Church Solar, which Corwin points out is appropriately named, as it’s the first community solar system on a church in the state. The investors in the company own the system and benefit from the tax credits, depreciation and revenue from selling the electricity and renewable energy credits. The expectation is that after about six years, the investors will have made their money back and then some, depending on each individual’s tax situation. At that point, they will donate the system to the church. Corwin says that the process went smoothly and that the congregants appreciate knowing their solar system produces clean energy and reduces the amount of coal-fired power being used. Fireman reports that there were more interested people than could be accommodated by the installed system, since available space was limited on the church roof. “In six years, once the church owns the system and depending on the price of electricity and other elements in the marketplace, the church may decide to net-meter and use the electricity itself,” Fireman says. To date, the system has been producing more energy than estimates predicted. In 2015, we installed a geo-thermal heating and cooling unit for our Sanctuary. As Asheville’s First Congregational United Church of Christ approached the century mark, some of the systems that power the gray granite building on Oak Street were showing their age. 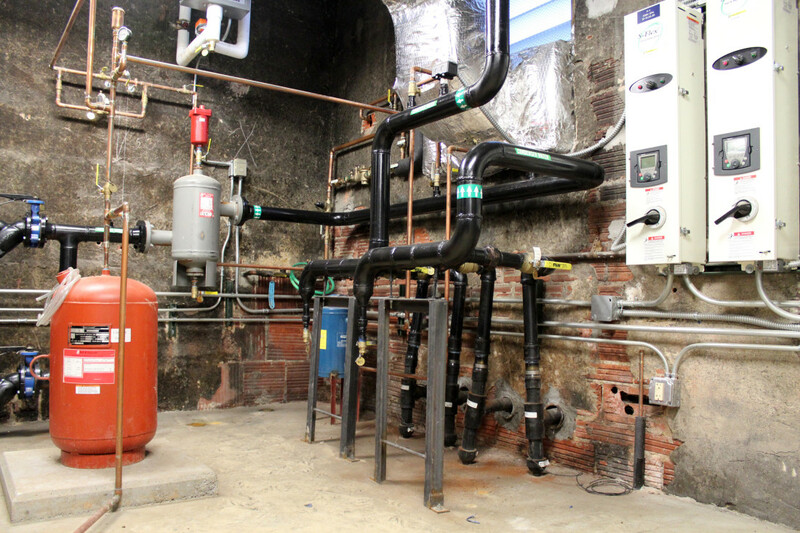 In 2012, the church’s massive gas-fired boiler gave up the ghost, and the congregation had to consider its options. A new boiler would cost about $25,000, Minister of Music, Gary Mitchell, recalls. But the forward-looking congregation, which had a strong commitment to environmental stewardship, wanted to explore other options. A geothermal heating and cooling system, which draws heat from the earth during the winter and returns heat to the earth in warm weather, seemed like the perfect complement to the solar array the church had installed in 2011. But when the estimate came in at $450,000, says Mitchell, he thought, “Of course we’ll go with the $25,000.” So he says he was “flabbergasted” when the congregation opted for the geothermal system. “I thought, these people are really willing to put their money where their mouth is,” he marveled. They’re not alone, notes Scott Hardin-Nieri, director of the Creation Care Alliance of Western North Carolina. And while there are as many approaches to environmental stewardship as there are churches dotting our region, more and more local faith communities, he says, “are seeking ways to heal the planet from a place of compassion and morality,” investing time, money and effort to align their buildings and practices with their spiritual commitment. ​Once First Congregational had decided to go geothermal, members opened their wallets. All the money for the project, says Mitchell, had been pledged before construction began. But if the fundraising effort went smoothly, the construction process soon ran into an obstacle. Engineer Bob Wiggins had originally hoped to install eight 750-foot-deep geothermal wells, but drillers kept hitting the water table. In the end, the contractor bored 10 550-foot wells around the perimeter of the church’s property. Water circulates through the wells in a closed loop comprising over a mile of piping, either pulling heat from the ground or returning it there. Although the system requires no energy for heating or cooling, it does use electricity to power the pumps that move the water through the pipes and the air-handling units that circulate warm or cool air through the building. Overall, geothermal systems use about 40 percent less energy than any other type of heating and cooling system, says Wiggins. He estimates that the system, which was finished in June, will produce a 5-7 percent annual return on the church’s initial investment. The technology, though, is most appropriate for heavily used buildings, says Wiggins. “For a church that’s occupied a few hours on Sunday and then shut up most of the rest of the time, the economics don’t work out.” But with over 65 community groups using First Congregational’s building during both day and evening hours, those lower operating costs will make up the larger upfront cost in 15-20 years, he predicts. The church also received a $10,000 rebate from Duke Energy, notes Wiggins.